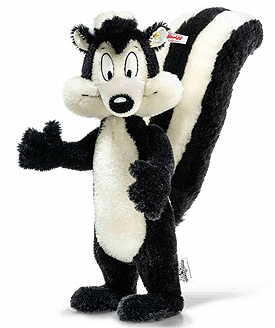 Pepe' Le Pew by Steiff. A beautiful limited edition Steiff item, made by hand in black and White mohair. LOONEY TUNES and all related characters and elements © & ™ Warner Bros. Entertainment Inc. (s19) Smooth. Slick. Seductive. Smelly. Pepé Le Pew thinks he’s make a great leading man, except his acting stinks; in fact, so does he. Pepé believes he’s irresistible to the ladies, but he doesn’t know that their running away is not being coy—it’s being terrified. But to Pepé, it’s the chase that makes a great romance. Just be sure you’re upwind.